Two youth workers Shannon & Julie from the American group called The Journey Community, visited us on 20-21 March for some Work Experience and to get to know how we at Horizon make a difference in the community through the arts! 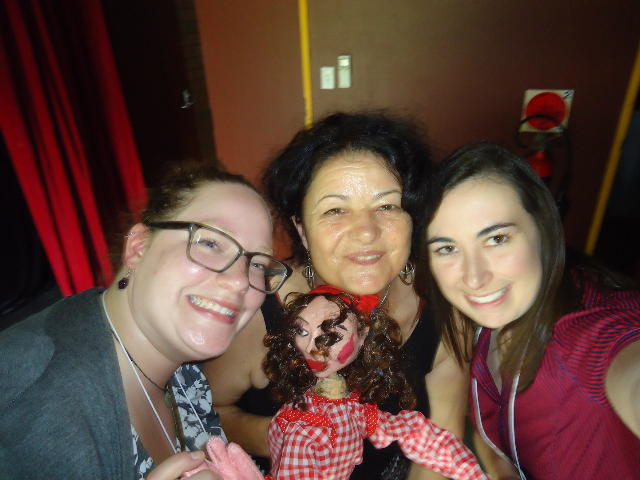 Here is what Shannon had to say about her visit …..
As a part of our IYWE 2014 trip to Australia, I had the pleasure of experience a small slice of life at Horizon Theatre. I was blown away by the diversity in programs they offered and the voice that they allow locals teens to share with their community. It’s always interesting to see the type of ways that youth workers engage their young people, and I can say I learned quite a few things. 1) It’s about listening to our kids, and not taking them for granted. 2) We live in a small world, and you never know the connections that you might share with someone else. It was interested to find that Jason now lives in Indiana and has some of the same contacts as we do! 3) Kids need love. Period. You don’t have to be an expert, but you do have to show you care. I am so thankful to know that I have a place I can return when I come back to Australia. And I am so thankful for all the good work that is ongoing at Horizon! Maddy was a real blessing to meet, she was so hospitable and accommodating to our needs. I truly felt a part of the Horizon family.